TEMPO.CO, Jakarta - Collections of classic batik typical to Javanese ancient palaces is being exhibited at the Keraton Ballroom of Tugu Hotel, Malang until April 27. The exhibition entitled "The Luxury of Batik Keraton, Embroudery and Jewelry Exhibition" is presenting batik which is produced by batik makers in several palaces in Surakarta, Yogyakarta, Cirebon, Sumenep, Pamekasan, and Bangkalan. 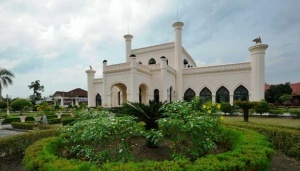 "The motives and patterns are distinctive," said Crescentia, Executive Manager of Tugu Hotel Malang on Friday, April 11. 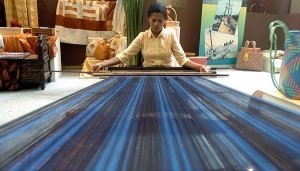 Most of the exhibited batik are colored in sogan color which is a brownish color produced from natural colorant of soga trees (Peltophorum pterocarpum) trunks, while the motives are dominated with the palaces' beauty and extravagance. Royal batik (batik keraton) is considered as special because of its classic and glamorous designs that is usually worn by princess in the palaces. 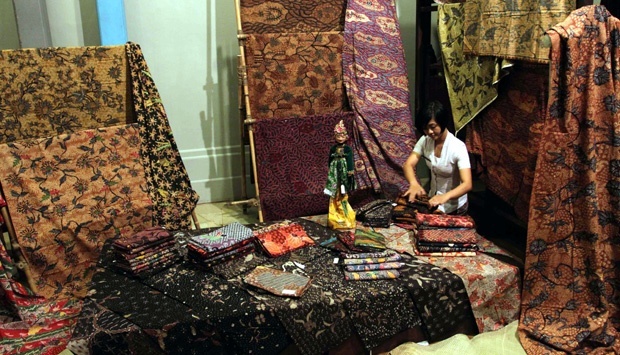 Among the batik-producing houses involved are Lenan, Salma Batik Cirebon, Melati Batik Madura, and Roe,ah Kebaya. 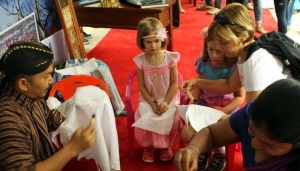 A batik named "Wahyu Tumurun" which was made in the 17th century during the era of Sultan Agung is also being exhibited. Pujianto, a batik observer, said that the "Wahyu Tumurun", having the motives of royal crowns alternated with plantations, bears the value of Javanese philosophy that means wishes for wahyu (revelation from God) that will bring prosperity to the people. "The background color of black is the symbol of eternity," said Pujianto. Other motives of royal batik such as paksi naga liman of Cirebon Palace, parang barong of Yogyakarta and Solo Palace, and sekar jagad and ler of Sumenep Palace, also hundreds-of-year-old "Gentongan" batik of Madura are also on display. These batik are offered in wide range of prices from Rp200,000 up to Rp10 million per pieces.